The compact Lil' Looper provides great effects and the ability for guitar and microphone. Get creative by recording two independent loops! Switch between Guitar input & Balanced Mic (1/4") input. The Looper has built-in effects for guitar and microphone. Like the VOX Dynamic Looper, you can combine two independent loops with a dozen onboard effects. It boasts an easy-to-use design, solid footswitches, versatile effects, and layering loops that are great for guitarists who want to get creative with expression. Record each of the two loops separately, create complex and original performances by changing between different chord patterns or phrases of differing length. Use the Loop Quantise feature to create phrases that match the same time signature and tempo. You can record for a total of 90 seconds on two independent loops. The Lil' Looper boasts not only distortion, compressor, phaser, and chorus effects, but also features effects that simulate an acoustic guitar or bass. There are a total of twelve effect types to get creative with. These Including effects for guitar and microphone. Use the balanced Mic input to use Lil' Looper's capabilities on vocals and acoustic instruments! Also take advantage of overdubbing with Undo/Redo and use the built-in metronome/rhythm guide. The Lil' Looper has a headphone output, so you can create in silence. Its compact design makes it easy to transport and it's good for the stage or at home. The Lil' Looper is battery operated, but can also be powered by an optional AC Adapter (DC9V) (not included). By getting an optional VFS2 Footswitch, which you can find on Gear4music.com, you can get extended hands-free control of the Lil' Looper. Use it to switch effects, play or stop loops, or erase phrases. 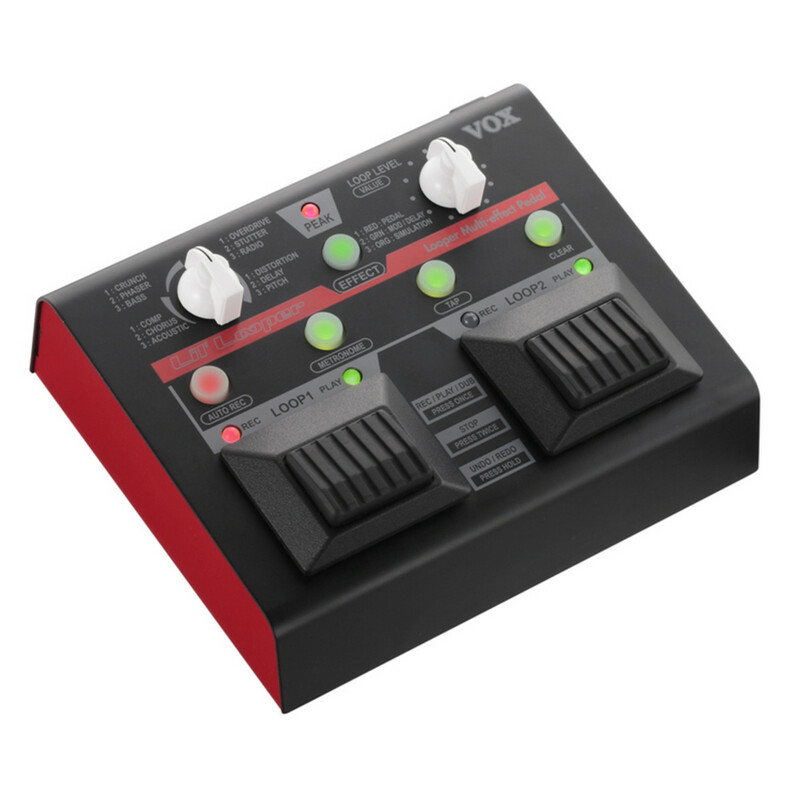 The VOX Lil' Looper includes six AA alkaline batteries for verifying operation.